Spiral staircase is a perfect compromise between style and economy, and with Exclusive Stairs, it will never look boring and common. A spiral staircase is constructed with a fixed center pole, which constitutes the main support for the treads winding around it. Such a design saves a lot of valuable space as stairs rotate around the pole to reach the exact height. Its exceptional design of curves and lines will make a statement of any interior, no matter if it is a classic or modern look you are searching for. Ask us to use the materials that suit the rest of your property to create a unique-looking staircase that will be a fantastic focal point of a living room or an office. 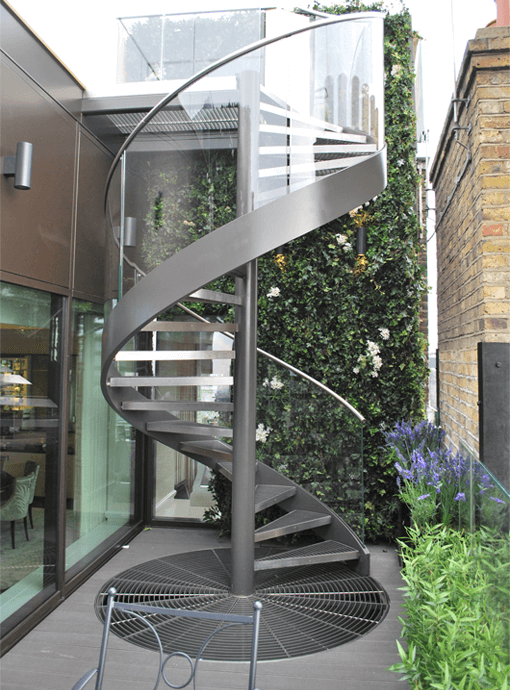 A spiral stairway can also make for an outstanding external staircase, which will complement any façade design.